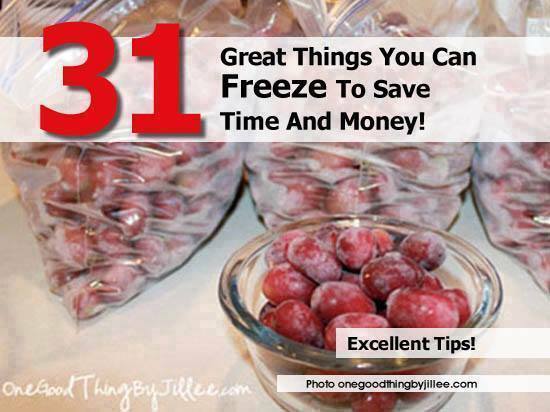 31 THINGS YOU CAN FREEZE TO SAVE TIME AND MONEY! What would we find in your freezer? CHEESE: You can freeze blocks of cheese without it becoming crumbly if you let it thaw completely before putting it in the fridge. If you prefer to shred your cheese first, add a tablespoon or so of cornstarch or flour to the bag and shake it to prevent clumping when it thaws. HOMEMADE PANCAKES, WAFFLES, FRENCH TOAST: Make up a few batches over the weekend for quick “defrost and go” breakfasts during the week. Freeze on a cookie sheet, then toss them in a freezer bag. Reheat in microwave, toaster, or toaster oven. WAY better then frozen ones you buy in store! FRUIT: When freezing fruit, it’s best to first freeze spread out on freezer or parchment paper on a cookie sheet, and then place in bags. Individual frozen pieces let you pull out just how much you need. Try keeping a “Smoothie Bag” in the freezer. Toss in extra apple wedges, peaches, pears, bananas, chunks of melon…any kind of fruit…and use in smoothies. RICE: Cook a big batch of rice, spread it on a cookie sheet on parchment paper and freeze. When the rice is frozen, just put in a freezer bag or containers and you have rice in a pinch! Great for BROWN rice which takes so long to cook! Use in casseroles, soups or fried rice. PIES: Make apple pies in the fall to enjoy throughout the year. Bake them, freeze them in freezer bags wrapped in freezer paper then when you have a hankering for pie, take out of the freezer, remove wrapping, and place in oven for 2 hours at 200 degrees. You can also freeze SLICES after baking a whole pie. CORN: An EASY way to freeze corn on the cob is to put the ears of corn, WITHOUT removing ANY silk or husk, straight into freezer. When you want to eat it, put it in microwave just the way you put it in the freezer and cook for 5 minutes on high for two ears or 4 minutes for one ear. The silk insulates and protects the corn while it cooks. Tastes like fresh-picked corn! TOMATOES: Roast roma tomatoes in oven at a low temp (225 degrees) with garlic, fresh herbs, and a drizzle of olive oil for 4 to 5 hours. When cooled, transfer to freezer bags. Use them in chili or in your own tomato-based sauces. PASTA: Whenever you make pasta, cook whole package. and freeze leftovers for later to add to soups and casseroles. Or freeze individual size portions in a baggie, making sure to squeeze out the air; get the bag as flat as possible. Reheat by running hot water over bag for a few minutes! FLOUR AND OTHER GRAINS: Freezing flour and other types of grain for at least 3 days discourages uninvited “guests” from hatching. You can also store it in the freezer, just make sure to double wrap to avoid condensation and to keep it from picking up other freezer smells. PESTO: Make (or buy) and freeze pesto in ice cube trays. Once frozen, pop it out and put in a freezer bag. Nice to have pesto whenever you want it. MASHED POTATOES: Using an ice cream scoop, put even portions of mashed potatoes onto parchment-lined cookie sheet. Freeze until hard then transfer into a freezer bag. These will keep in the freezer for at least 2 months. COOKIE DOUGH: Make a batch of cookie dough, scoop onto cookie sheets and freeze. When they are frozen solid. put them in freezer bags. When you NEED cookies, bake as few or as many as you NEED without lots of waste or guilt. Just add 1 to 2 minutes to the cook time. You can also make “slice-and-bake” cookie dough by shaping it into a cylinder, and freezing it wrapped in foil. SOUPS AND CHILI: Cool leftover soup completely and transfer to a freezer-friendly container, leaving about 1 cup of empty space for expansion during freezing. The night before eating, move the container to the fridge to thaw safely and then reheat and serve. BROTH AND STOCK: Keep a gallon bag in freezer and add any leftover veggie pieces, including onion peels, celery stalks, potato peels, etc. When you have enough, make vegetable stock. Keep another bag for pan drippings or sauces that are left after cooking chicken. This can be used to flavor soups. SANDWICHES: When packing lunches for school/work, it’s a time-saver to pull a sandwich straight from the freezer. Just throw it into your lunch box/bag in the morning; it’s thawed by lunch time. It also helps keep meat cold. Peanut butter and jelly or honey, or deli meat and a slice of cheese work well. You can freeze butter or mustard but not mayo, lettuce, or tomato. Pack these separately or add in the morning. You can also freeze breakfast sandwiches. Cook scrambled eggs and sausage/bacon in bulk, pile them onto biscuits or English muffins, wrap them individually and freeze. In the morning, grab out of the freezer, microwave, and enjoy. POTATO CHIPS, CRACKERS, & PRETZELS: Stock up on chips, crackers, and pretzels when they’re on sale and throw them in the freezer. FROZEN chips actually taste BETTER. Eat them straight from freezer; they are crisper and the flavors pop. MILK: Ever wonder why plastic milk jugs have those circle indents on the side?? They are there to allow milk to expand while freezing! To use frozen milk, let thaw, and then SHAKE WELL before opening, to make sure any solids are remixed. You can also freeze buttermilk. No more tossing out half a quart because you only needed a cup. JUICE: Like milk, the only concern about freezing juice is leaving room for expansion. A good rule of thumb is to take out 8 ounces for every half gallon of juice. Stock up when it goes on sale or at a discount warehouse. BREAD & BAKED GOODS: When your favorite bread is on sale, stock up; freeze it. Or when in a baking mood, make extras of your favorite baked goods and freeze them for later. BUTTER CREAM FROSTING: Freeze leftover frosting. When when you need to frost something, let it thaw in the fridge, then whip it up, and color/decorate as if it were just made. TOMATO PASTE: Most recipes using tomato paste only call for one tablespoon out of the whole can. Then you’re left with an almost full OPEN can. What to do!? Put the rest in a sandwich bag, flatten it out in freezer, and when you need a tablespoon, just break off a piece and throw it into whatever you are cooking. DICED VEGGIES: Dice onions, chili’s, or bell peppers, then freeze flat in gallon freezer bags. As they are freezing, press “score lines” into the bags so you can break off as much or as little as you wish for recipes. HOMEMADE & STORE_BOUGHT DOUGH: You can freeze all kinds of homemade dough – pizza dough, focaccia dough, pie crust – shaped in a ball and wrapped in Saran Wrap. Or you can also freeze canned biscuits, crescent rolls, pizza dough, etc. right in the tube. EGGS: Crack the eggs in a freezer bag, and freeze. Or crack eggs into an ice cube tray for cakes and cookies. Thaw out in refrigerator and use as you normally would. SHREDDED CHICKEN: Cook a big batch and shred or when you get a rotisserie from the grocery store, shred the leftovers and put it in a bag. LEMON/LIME JUICE & ZEST: Squeeze lemons and limes into ice cube trays, then pop them out after they have frozen and store in freezer bags. Now you have “fresh” lemon and lime juice whenever you need it. Don’t forget to ZEST the lemons/limes first and keep that in the freezer as well. HERBS: Freeze fresh herbs in ice-cube trays with a little water or leftover stock to use for soups, stews, and casseroles later in the year. MARINATED MEAT: Place meat in a freezer bag, pour in marinade and freeze. When you defrost it, it will be fully-marinated and ready to cook. HOMEMADE CASSEROLES: When you are cooking a casseroles (lasagna, mac and cheese, enchiladas, etc), why not make 2 and FREEZE one for when unexpected company drops by or to use during a busy school/work week. 1. Freeze entire casserole by lining base of dish with freezer paper, add ingredients, then freeze it in the dish. When it’s frozen solid, remove from dish (easy to do thanks to the freezer paper), rewrap the food, and put back in the freezer. When you want the item for a meal, unwrap and place in the original dish to defrost and cook. FISH STICKS: Forget those tasteless sticks in the blue box. Buy fresh fish in quantity, cut it crosswise into fish ‘fingers,’ dip in egg, and dredge in flour and bread crumbs, then freeze laid out on a tray before transferring to freezer bags. HAMBURGER: Pre-cook ground hamburger and portion it out for meals. When you need hamburger for shepherd’s pie, sloppy joes, tacos, or whatever, just pull it out of the freezer, add the seasoning, and microwave. Three minutes, or 1 minute and 30 seconds if it’s going to be baked and doesn’t need to be thawed all the way. For crock pot meals, like chili, just throw it in frozen. This entry was posted in Just Good Stuff and tagged food, Freeze, Freezer, good advice, Save Money, Save Time, situations. Bookmark the permalink.